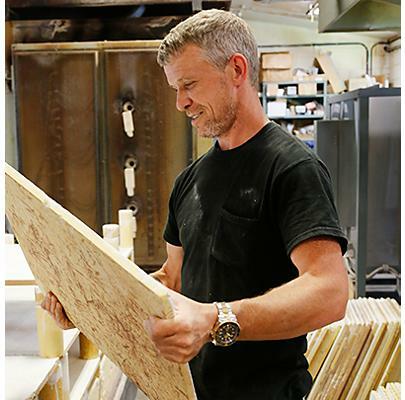 Jessie has been working at MacKenzie-Childs for over 25 years. He has worked in just about every department, but his favorite is the kiln room. A notable asset to the artisan team, he prepares the glazes used on our ceramic products, and also developed the techniques we use to apply them. He learned his craft from many of the original employees of the company, along with ceramics engineers. “The ceramic industry changes daily and you have to be able to keep up!” Other creative pursuits of his include collecting watches, and learning how to take them apart and rebuild them. For Jessie, trying to pick a favorite spot on the campus was difficult; he feels as though the entire place is home.